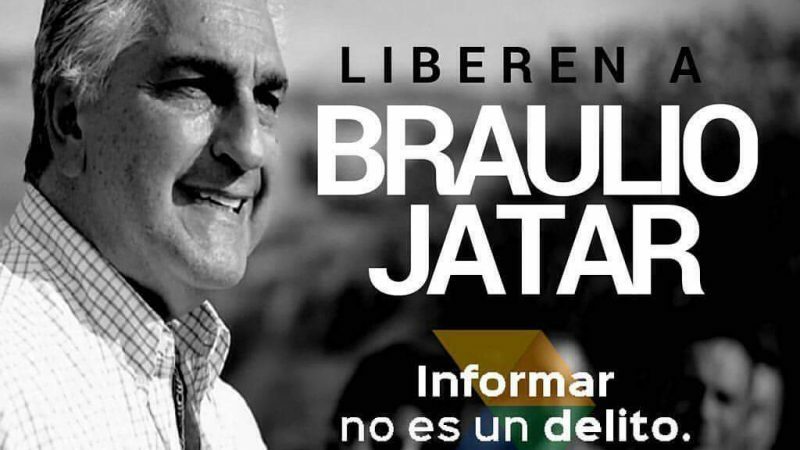 “Free Braulio Jatar. Informing is not a crime” Image used by the campaign demanding Jatar's freedom on Twitter, widely shared online. After fears of a forced disappearance that quickly flooded citizen media in Venezuela, news surfaced that Chilean-Venezuelan journalist and lawyer Braulio Jatar, director of the website “Reporte Confidencial“, is in custody of the national intelligence agency (SEBIN) on charges of money laundering. According to family and co-workers, the whereabouts of Jatar were unknown for hours and he was unable to communicate and his home was searched. His sister also said through Twitter that Jatar was denied medication for a chronic condition. Jatar was detained along with over 30 other people — who were later freed — during a protest in the locality of Villa Rosa, in the island region of Nueva Esparta, in northeastern Venezuela. The Villa Rosa hashtag went viral on September 2nd and 3rd on Venezuelan social media when residents protested the presence of the president Nicolás Maduro. According to social media users and videos shared online, when Maduro arrived in Villa Rosa, residents took to the streets, banging pots and pans (a form of protest called a “cacerolazo,” referring to the “cacerola” or casserole dish) and ultimately forcing him to leave the city. The incident came in the wake of demonstrations in Venezuela’s capital, in which thousands of people campaigned for a referendum to recall Maduro. Jatar's supporters believe that his news website's coverage of the protest in Villa Rosa is the real reason he’s in custody. Denunció que el procedimiento de detención fue irregular, así como los hechos sucedidos seguidamente, al ser trasladado a la sede del Sebín donde fue entrevistado y formado el expediente a espalda de los que se establece probatoriamente en las actas del proceso, señalando la asistencia de testigos que en efecto no estuvieron, y eso vamos a acreditar que no ocurrió, así como se acreditó la existencia de un supuesto maletín con dinero, lo cual tambien es falso. [Jatar’s lawyer] reported that the arresting procedures were irregular, as were the incidents that took place afterwards. [Jatar] was transferred to the SEBIN [the intelligence agency’s headquarters] where he was interviewed and where his file was opened, ignoring due process provisions. They indicated the presence of two witnesses that were not there, and they noted the existence of an alleged briefcase with money, which is also false. The Victim’s Families Committee (CoFaVic), a group devoted to human rights protection, based in Caracas and created in the aftermath of the series riots known as El Caracazo, also urged the government to correct the irregularities that took place during Jatar’s arrest. For the organization, the uncertainty and the silence of the days before the intelligence agency acknowledged having arrested Jatar and other political prisoners can be seen as crimes against humanity, even if the people in question are still alive. Chile’s Ministry of Foreign Affairs, Heraldo Muñoz, expressed concern for Jatar’s safety and assured being very attentive to anything that could happen to Jatar in Venezuela. Braulio Jatar's case is the best example of Venezuela's freedom of the press being “conditional”.